Why Is My TV Screen Zoomed In? A button on one of the remote controls may have been pressed by mistake. The TV remote has buttons that when pressed by mistake will cause the “Picture Size” problem. This can also happen when using a CABLE or SAT remote and pressing a button by mistake. All remote controls vary and the aspect ratio keys/buttons may have different names. Aspect ratio simply means the height to width for the picture on the television screen. When the TV picture is zoomed in, the aspect ratio does not equal that to the screen. This causes the picture on the screen to be cut at the top and bottom or both left and right sides. NOTE: The resolution appears to degrade when the picture is zoomed. How To Fix TV Zoomed In? TV REMOTE CONTROL: Use the TELEVISION remote control and select the button that says RATIO, HOME, WIDE, ZOOM, P.SIZE, FORMAT, PIC SIZE, or PIC MODE. Press the button and cycle through the screen ratios until the picture returns to normal. 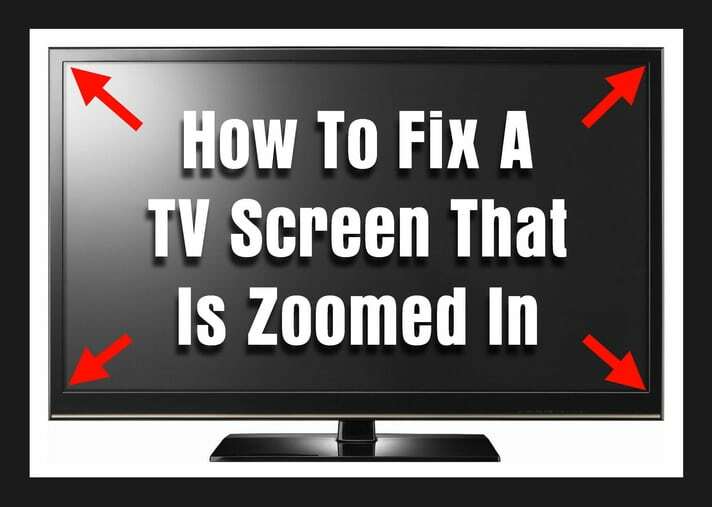 If this does not work, press MENU and go to PICTURE SETTINGS or ASPECT RATIO in the TV MENU and set the screen size accordingly to “unzoom” the screen. CAB or SAT REMOTE CONTROL: Use the CABLE or SATELLITE remote control and select MENU. Once in the MENU, select ASPECT RATIO or PICTURE SETTINGS and adjust the picture size to fix the problem. Some SAT or CAB remotes may have a HD ZOOM, WIDE, or PICTURE button that can be selected to fix the zoomed in screen. Cycle through the options until the TV screen ratio returns to normal. 4. Choose the correct ASPECT RATIO such as Widescreen or 16:9. 5. Save settings if applicable and exit the TV MENU. 6. Check the remote keys for ZOOM, P.SIZE, HOME, RATIO, FORMAT, PIC SIZE, or PIC MODE and select until screen returns to normal. 7. Once the adjustments are made the TV picture size should now be the correct aspect ratio. Select different HDMI inputs to see if the issue is with the TV or with the component connected. If closed captioning is turned on, this can change the screen ratio and “cut” the sides or top and bottom of the picture off. The screen ratio issue can be from the broadcast you are watching. The program that is displayed on your TV could be be broadcast in a screen aspect ratio that may not fill your screen 100%. This is normal and is expected when watching older programs or shows. Certain broadcasters or older shows are broadcast in a format that will show black bars on the right and left of your TV screen. If the TV MENU is also stretched or zoomed in, then the problem cannot be fixed by simple adjustments. There may be an issue with the TV that needs troubleshooting by a professional. NOTE: The screen ratio solutions on this page will work for all TVs and cable setups including Samsung, SONY, Comcast, COX, LG, Vizio, Directv, FIOS, FIRE TV, Apple and more. Need help with your TV screen ratio? Please ask your question below and include the issue you are experiencing and what type of TV you have. We will get back to your with some tips to fix your TV. Previous post: Washing Machine Not Dispensing Detergent Into Washer – Full Of Water – How To Fix?